Programmable logic controllers, also called programmable controllers or PLCs, are solid-state members of the computer family, using integrated circuits instead of electromechanical devices to implement control functions. They are capable of storing instructions, such as sequencing, timing, counting, arithmetic, data manipulation, and communication, to control industrial machines and processes. Programmable controllers have many definitions. 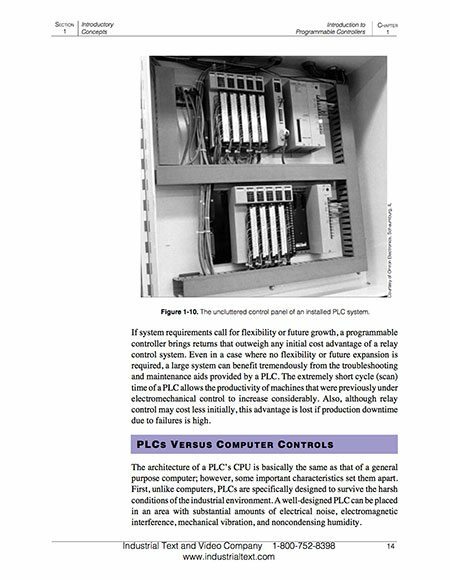 However, PLCs can be thought of in simple terms as industrial computers with specially designed architecture in both their central units (the PLC itself) and their interfacing circuitry to field devices (input/output connections to the real world). Figure 1-1 illustrates a conceptual diagram of a PLC application. The first programmable controllers were more or less just relay replacers. Their primary function was to perform the sequential operations that were previously implemented with relays. These operations included ON/OFF control of machines and processes that required repetitive operations, such as transfer lines and grinding and boring machines. However, these programmable controllers were a vast improvement over relays. They were easily installed, used considerably less space and energy, had diagnostic indicators that aided troubleshooting, and unlike relays, were reusable if a project was scrapped. 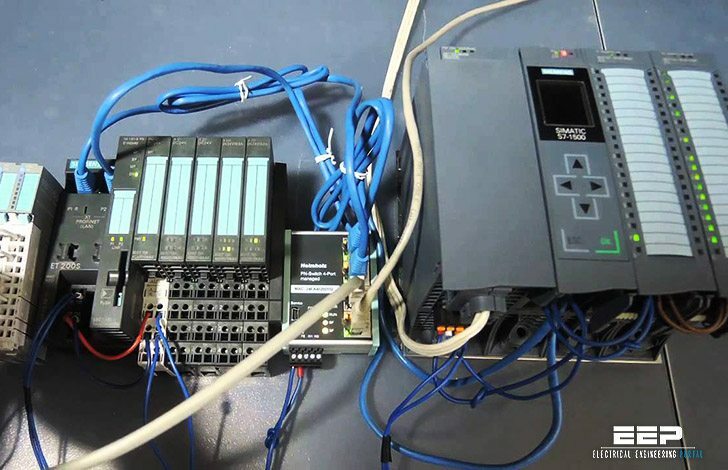 Programmable controllers can be considered newcomers when they are compared to their elder predecessors in traditional control equipment technology, such as old hardwired relay systems, analog instrumentation, and other types of early solid-state logic. Although PLC functions, such as speed of operation, types of interfaces, and data processing capabilities, have improved throughout the years, their specifications still hold to the designers’ original intentions – they are simple to use and maintain. I would like to know if anyone knows how this book is comparing to W. Bolton, 2009, Programmable Logic Controllers, Fifth Edition [ISBN: 978-1856177511] in 2017 I have gotten this one as being a book of recommended book for resource in a PLC course? Hi guys,i have a problem with downloading certain files, like this one.The website just transfers me to another page. Detail about earthing in house. How to make a good earth pit. Thank you very much for your contribution to the field of Engineering…. Hope, none other than EEP share such an wonderful info about PLC from theory to Implementation. It surely help students… lot… not only them… ofcourse engineers in the industry and the professors of the colleges. Special thanks once again.